Heavy snowfall on March 12, 2004, across north China's Inner Mongolia Autonomous Region, Mongolia and Russia, caused train and highway traffic to stop for several days along the Russia-China border. 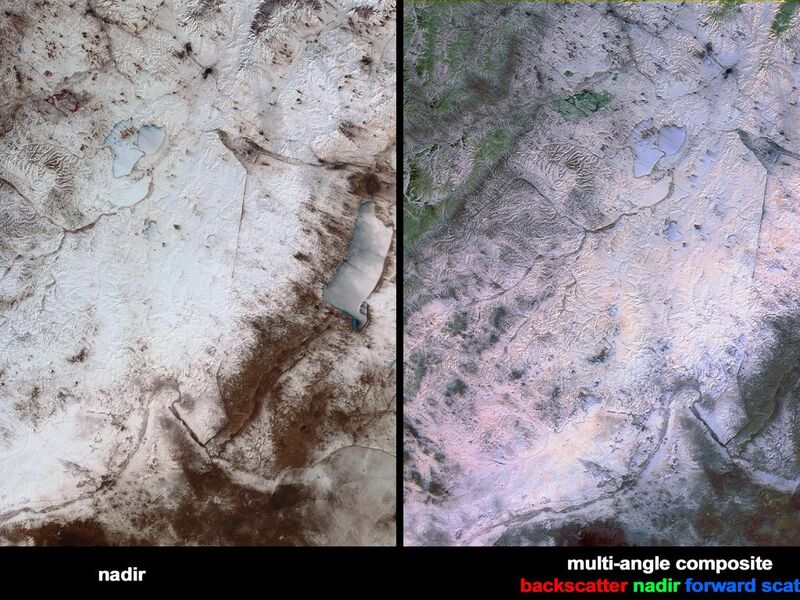 This pair of images from the Multi-angle Imaging SpectroRadiometer (MISR) highlights the snow and surface properties across the region on March 13. 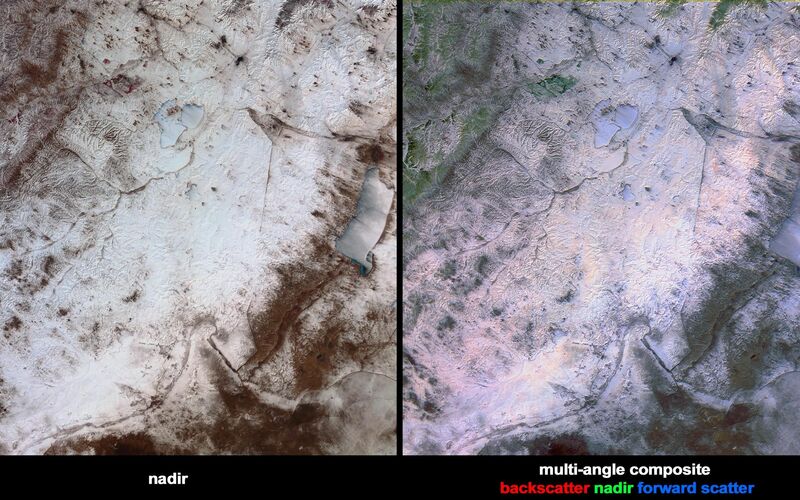 The left-hand image is a multi-spectral false-color view made from the near-infrared, red, and green bands of MISR's vertical-viewing (nadir) camera. The right-hand image is a multi-angle false-color view made from the red band data of the 46-degree aftward camera, the nadir camera, and the 46-degree forward camera. 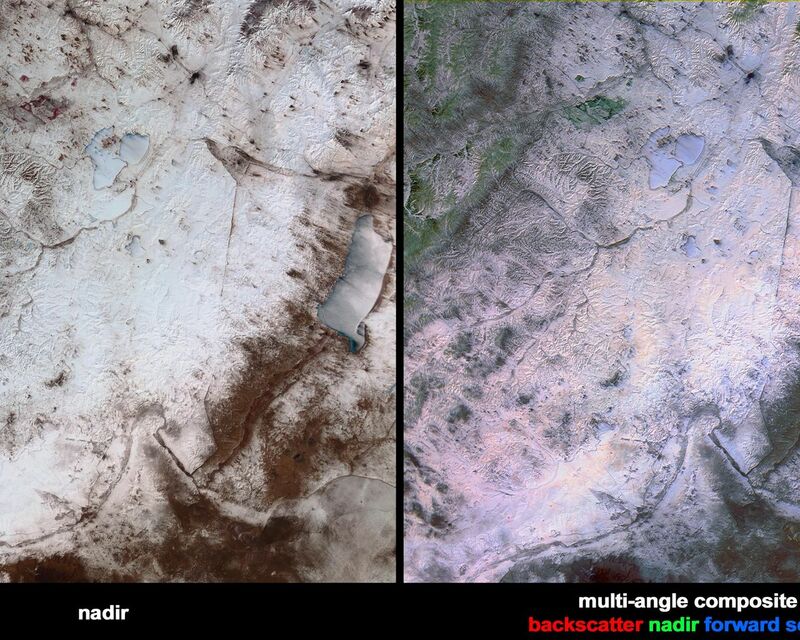 About midway between the frozen expanse of China's Hulun Nur Lake (along the right-hand edge of the images) and Russia's Torey Lakes (above image center) is a dark linear feature that corresponds with the China-Mongolia border. In the upper portion of the images, many small plumes of black smoke rise from coal and wood fires and blow toward the southeast over the frozen lakes and snow-covered grasslands. Along the upper left-hand portion of the images, in Russia's Yablonovyy mountain range and the Onon River Valley, the terrain becomes more hilly and forested. In the nadir image, vegetation appears in shades of red, owing to its high near-infrared reflectivity. In the multi-angle composite, open-canopy forested areas are indicated by green hues. Since this is a multi-angle composite, the green color arises not from the color of the leaves but from the architecture of the surface cover. The green areas appear brighter at the nadir angle than at the oblique angles because more of the snow-covered surface in the gaps between the trees is visible. 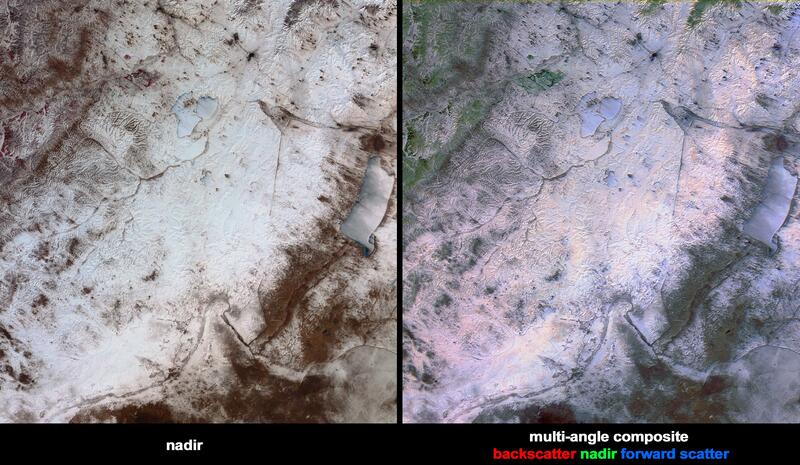 Color variations in the multi-angle composite also indicate angular reflectance properties for areas covered by snow and ice. The light blue color of the frozen lakes is due to the increased forward scattering of smooth ice, and light orange colors indicate rougher ice or snow, which scatters more light in the backward direction. The Multi-angle Imaging SpectroRadiometer observes the daylit Earth continuously and every 9 days views the entire Earth between 82 degrees north and 82 degrees south latitude. These data products were generated from a portion of the imagery acquired during Terra orbit 22525. The panels cover an area of about 355 kilometers x 380 kilometers, and utilize data from blocks 50 to 52 within World Reference System-2 path 126.